Activity and excercise are an important part of good health maintenance and well-being. Unfortunately, sometimes embarrasment regarding our varicose veins and spider veins make it difficult for some of us to wear comfortable clothes. Also, discomfort, throbbing, and stinging sensations can sometimes be associated with varicose and spider veins limiting normal activity. 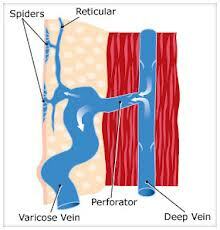 WHAT IS A SPIDER VEIN? Spider veins or "telangiectasias" are small veins under the skin usually developing from dilated blood channels connected to underlying veins. These most commonly occur on the legs, sometimes on the face. They are blue , bluish-red, or dark purple in color. They consist of dilated veins that are poorly functioning. Being smaller, thread-like, superficial, interconnected in appearance gives them the name of "Spider' veins, as opposed to larger , tubular or bulging "Varicose" veins. WHAT IS SCLEROTHERAPY? Spider veins are smaller and are generally treated with a procedure called Sclerotherapy in which a solution called a sclerosant is injected into the veins eventually closing off the vein making it disappear. Sometimes, laser treatment can also be performed instead of or in addition to the Sclerotherapy treatment. During Sclerotherapy the Doctor usually uses magnification to help him/her see the thread thin veins to inject a small amount of special fluid (sclerosant) . into the Spider vein. This "irritates" the vein and the infammation which ocurrs in the vessel wall causes the vein to permanently dissappear over the next three to four weeks. 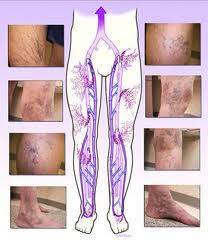 Medium to large varicose veins can accompany the smaller Spider veins in some persons. These can also be treated with Sclerotherapy sclerosants or with Endovenous (internal fiber-optic) laser. Generally for individuals with significant numbers of larger varicose veins it is recommended they be referred to a Doctor who has experience performing the Fiberoptic laser Endovenous procedure to treat the saphenous vein. For medium to smaller varicose veins, a special technique using foaming sclerosant is often used with medium size varicose veins and feeder blood vessels greater then 5 mm in size. Ultrasound (Duplex) are used for locating and mapping the more superficial varicosities and deeper feeder vessels (perforators). mmmmmm WILL SCLEROTHERAPY CURE MY SPIDER VEINS? 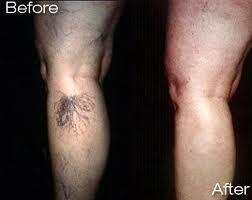 The majority of patients having Sclerotherapy will have significant improvement in their visible spider veins. Generally the patient experiences a 50% to 60% improvement per treatment session. 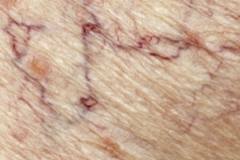 An area with spider veins will have up to 90% improvement with approximately three to six treatment sesions. Rarely, less than 10% of the time, will patients not reach this desired goal. HOW MANY SESSIONS WILL I NEED? The number of treatments to clear or improve the condition differs from patient to patient, depending on the extent of the varicose and spider veins present. The average number of treatments is 3-4. Matting- Matting refers to the development of new tiny lines in the treated area. It may ocurr 2 - 4 weeks after the treatment and usually fades within 4 - 6 months. It ocurrs in up to 18% of women receiving estrogen therapy and in 2-4% of all patients. Trapped Blood- Occasionally, the closing of the treated vein is slow to occur and a small pocket of blood remains as a blue dot. The doctor can remove this with a small needle and the condition is not dangerous. In less than 1% of the cases, depending on the sclerosant used, you may rarely have some of these side effects. 72% Glycerin is very popular in Europe and becoming more popular in the United States as it seems to be more effective than the Detergents in small reticular and spider veins..Glycerin tends to have minimal risks of matting, ulceration and bruising in spider veins and small varicosities. ....you can also have Itching, ulceration, Allergic reaction, Pain, Bruising, and phlebitis. Prior to the procedure the patient has a consultation with the Doctor to review veins of concern and preparations. BROMALIN 500 mg (mineral) tablets 2 to 3 times per day SEVEN days before and SEVEN days after the sclero treatment. Remember to wear loose clothing, shorts, Capris or skirt the day of the consultation and the day of the treatment. Also, remember to bring a wide Ace Wrap with you or a support stocking as recommended by the Doctor. Shower prior to the treatment as you will be wearing the cotton ball dressing the Doctor applies and the Ace wrap overnight. Eat normally the day of the Treatment. 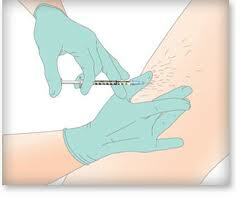 Generally sclerotherapy sessions are scheduled according to "Blocks" of time about fifteen to twenty minutes long. During the session , the doctor will inject the Spider or small varicose vessels in a localized area such as the back of the calf, or front of the Right thigh or back of the knee. The Doctor often uses magnification and special polarizing lenses to better visualize the fine thread-like Spider veins, The Physician can also use special Transluminator lighting instrument to visualize the deeper "feeder and perforating" veins connected to the spider veins. During the Sclerotherapy session, the Doctor will perform multple sclerotherapy injections, but because it is done with a very fine needle, the procedure has minimal discomfort and many of the injections are painless. At the end of the procedure, cotton balls with paper tape are applied on all the treated area. An "Ace Wrap" is then applied on the treated area. Some physicians recommend Support Hose type stocking (Grade two graduated compression hosiery) to be purchased and used post treatment, especially if medium to larger varicose veins have been treated. After the procedure, the spider veins may appear darker and more prominent for one to three weeks and then they are expected to fade until they disappear in the following one to two weeks. We recommend keeping the cotton balls and paper tape application on for twenty-four hours and then removed. The Ace wrap or support stockings(Grade 2 graduated compression hosiery) to be kept on for a total of four to five days. During that period of time daily ambulation(walking) for thirty minutes and activity is recommended. Weight/strength training and strenous activity such as running and Aerobics are to be avoided for the first five days. After this the Ace wrap or support stockings can be removed and regular activity resumed.